When arthritis affects your big toe, your foot hurts when it pushes on the ground. You may even experience a crackling sensation when you move your toe joint. Arthritis often appears in the big toe joint and may take the form of a bump on the top of your big toe joint. Additionally, a bump may appear on the outer side of your big toe joint; this is referred to as a bunion. You may notice enlargement around the joint and swelling, as well as limitation of motion, hence the condition is referred to as Hallux Limitus or Hallux Rigidus: Hallux referring to the big toe. Conservative treatment for this problems may consist of orthotic therapy, anti-inflammatory medications either oral or injectable. If conservative therapy fails then contemporary sugical intervention is quite effective to reduce pain.The surgical procedure that is performed is based on the degree of deformity and loss of cartilage, as well as patients age, activity level and expectations. As the name implies, this refers to the middle portion of the foot where the long metatarsal bones that correspond to each of the toes meets the arch of the foot. If arthritis develops in this region, often times you will feel pain and see swelling and boney prominences on the top of their foot. This represents arthritic changes effecting the middle joints of the foot. This is often a very mainful condition that makes comfortable ambulation difficult. Radiographs and CT scans are sometimes helpful in determining the exact joints that are affected. Here too, conservative treatment should be attempted. However if the condition remains chronic and its severity increases surgery is quite effective to decrease pain and allow improved function. Surgery generally involves a remodeling of the joint with possible fusion or locking of the joint space. This joint is in the space between the heel bone (calcaneus) and the inner ankle bone (talus). Sometimes physicians refer to this joint as the lower ankle joint. Various forms of arthritis can effect this joint, thereby causing a person to have discomfort ,swelling and limited range of motion which can over time become a progressive disability. Thereby making normal walking difficult. Especially when walking on an uneven terain. 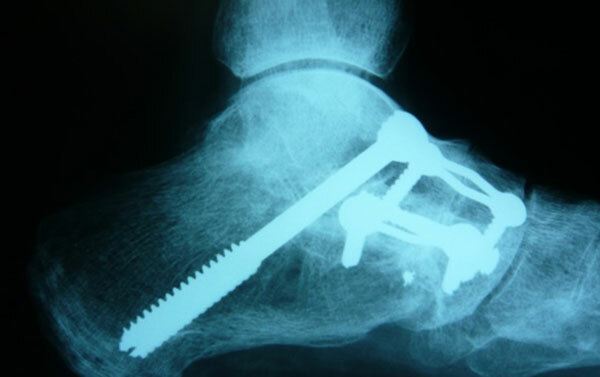 As in the bove regions of the foot conservative treatment generally consists of trying a combination of anti-inflammatory medications either oral or injectable, orthotitic trial, and possible use of splints or braces. However, if these methods are not effective or the condition is too advanced then surgical intervention would be indicated. This generally consists of a fusion type procedure-generally using internal fixation ( screws +/or plates ) to lock the deformed joints and allow healing. These procedure as become quite effective in treating these problems with the help of modern technological advancements. In addition to neglected ankle injuries being a cause of arthritis, you may suffer from arthritis in the ankle as a result of generalized osteoarthritis, rheumatoid arthritis, and even psoriatic arthritis. If you have had advanced inflammation or possibly even a tear of your inner ankle tendon (posterior tibial tendon) you may have developed arthritic changes in your ankle joint. Arthritis involves the inflammation of the ankle joint structure as well as boney overgrowth and narrowing of the joint itself. Please note in the example above that this is a case of post traumatic arthritis. This condition usually causes pain with progressive walking and activities that utilize motion of the joint. Many people experience a lack of adequate range of motion of the joint as well as swelling around the joint. Often times this leads to an inability to bear normal weight on the affected extremity. This may lead to many forms of compensation which can in turn result in increased pain in other areas throughout your body. The gold standard for treatment of severe ankle problems would involve fusion of the joint. This involves a procedure that stabilizes the joint, prevents further range of motion, usually with the use of internal fixation such as plates or screws. The picture below, on the right, shows an Integra locking plate which provides for excellent stabilization of these joints. Please note that in this particular case the subtalar joint has been fused as well. This particular procedure often times results in significant reduction of your pain, however, it limits obvious mobility of the joint. Over the last few years a great amount of research and development has led to the creation of new implant devices for arthritic ankles. 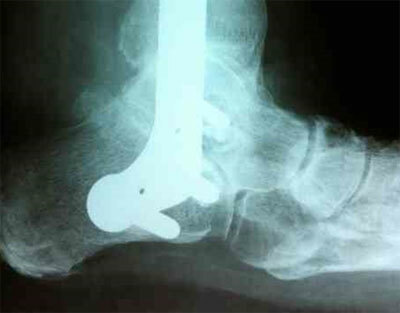 One such example is the Wright in-bone ankle implant that is demonstrated with radiograph below, on the left. X-Rays are needed to specifically diagnose the condition. Further tests by a physician may involve CAT scans, which show damage to bone, and Magnetic Resonance Imaging, MRI, which can show damage to the joint lining. A physician may also attempt a local injection to help diagnosis the specific condition and location of your pain. Your physician may initally prescribe a medication that may be in the form of a pill or an injection, with the goal of reducing pain and inflammation. Many new and improved medications are now entering the market such as ( Ice may help relieve mild symptoms that occur after activity). Physical therapy is also helpful. Various custom made orthotics may be of benefit. There are specific procedures that are used for treatment of arthritis. 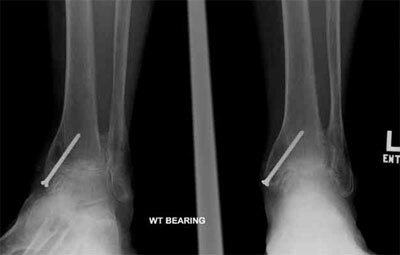 There are also specific procedures that can be applied to surgical treatment of specific regions of the foot or ankle. In general, milder forms of arthritis may be treatable by remodelling the affected joint. When this involves the big toe joint, this procedure is called a cheilectomy. In more advanced cases, as damage occurs to the actual internal cartilage between the joints, either fusion or implant procedures are necessary. Fusion is also also referred to as an arthrodesis. Technology has allowed for improvements in these procedures allowing for patients to return to better function with decreased pain. The photos above demonstrate some of the varied surgical procedures for treating arthritis. 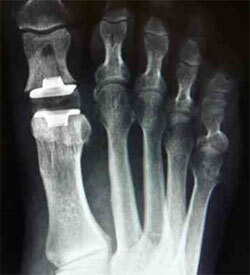 From the left to right; an arthrodesis of the great toe joint ( first metatarsal phalangeal joint ) using a plate and screw. The second photo illustrates a Wright medical implant procedure on the great toe joint ( first metatarsal phalangeal joint ). 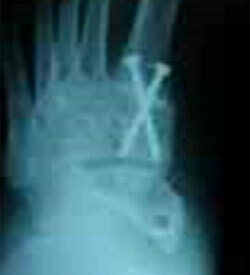 The third photo illustrates cross screw fixation for fusion of a midfoot joint. The fourth photo illustrates an ankle and subtalar joint fusion with Integra locking plate technology. The fifth photo illustrates a triple arthrodesis. During the early stages of recovery, your foot will be bandaged and possibly even casted. Depending on the exact surgery performed you may not be able to bear weight on the foot for a period of time. During that period you may require the use of crutches or a walker depending on your level of activity and age. Follow up with your physician as scheduled. These visits help ensure that your foot or ankle heals properly.